When my wonderous journeys began manifesting on film, I received a great deal of help from my little dog, Doli. I believe he was truly an angel in a furry body. He would pant with his big smile, look up and down and telepathically tell me where to shoot my camera. Doli would travel with me to the desert and assist with alerting me of "orbs" floating around us. 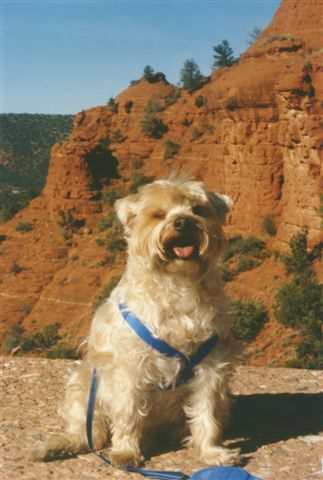 August 21, 1995, Doli returned to "Doggie Heaven", but his memory and spirit presence is ever with me. As we allow the animal kingdom to communicate with us...we learn how close we are to the mysteries of the Universe.